Rev. 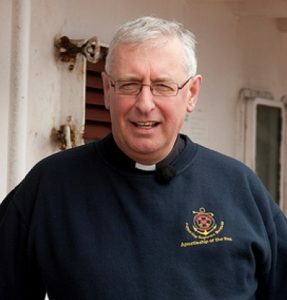 Stone has been a port chaplain for the Apostleship of the Sea since June 2010 supporting seafarers who arrive on ships in the south coast of England. “I am proud to work for the Apostleship of the Sea, the greatest and most effective maritime charity in the world. I am privileged to serve so many wonderful seafarers from so many countries around the world,” he said. Identified as an advocate for seafarers, the chaplain has not been afraid to speak out on their behalf, telling of the evidence that he has seen of ships breaking health and safety laws and ignoring the rights of crewmen. In 2016 for example, Deacon Stone complained that port authorities lacked the power to detain a ship for what he described as “deficiencies” and added, “There must be a point when a civil offence becomes a criminal one, especially in cases where abuse and modern slavery is suspected. In total 1,123 people were named in the British New Year’s Honours List, which includes people who have given their lifetimes to supporting others. 70% of the recipients are people who have undertaken outstanding work in their communities either in a voluntary or paid capacity, following Prime Minister Theresa May’s strategic steer, that she would like more honours to go to people contributing to society and their communities. Famous names on the list this year include Beetle, ‘Ringo Starr’, Richard Starkey, and singer-songwriter Barry Gibb, who both receive knighthoods.